Arguably the purest driver’s car to wear the 3-pointed star, the Mercedes-AMG GT is as thrilling to drive as it is to look at. The 2016 mercedes benz mercedes amg gt electric vehicle qualifies for a federal tax credit of up to $7,500, effectively reducing the net base price. As electronics burrow their way into every facet of modern automobiles, many high-end sports cars have transformed into cold, calculated speed machines. Though utterly cutting-edge, the first-ever Mercedes-AMG GT and higher-performing GT S variant contain something an algorithm could never replicate: a soul. Vertigo-inducing acceleration, catlike cornering abilities, and aluminum body panels fused together as if sculpted by the gods tell only a fraction of the story. Then again, with prices ranging from roughly $110,000 to well over $170,000, the 2016 AMG GT must contend with vaunted nameplates like the Porsche 911 Carrera S, Jaguar F-Type R and Audi R8 V10. Yet, in our opinion, this new kid on the block now has the largest target on its back. Every premium-performance car serves as a great barroom number generator, but the 2016 Mercedes-AMG GT pairs those bragging rights with an inimitable dose of driving passion and visceral engagement. Simply put, the AMG GT is much more than simply an instrument of speed. If pure performance trumps all, the more affordable 2017 Nissan GT-R or 2017 Porsche 911 Carrera 4S might be worth your consideration. 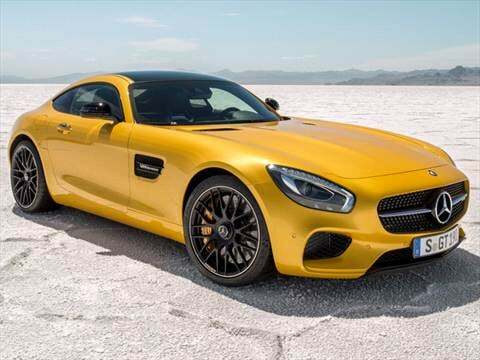 The Mercedes-AMG GT and GT S are all-new for the 2016 model year, and supplant the outgoing SLS AMG coupe. One of the harshest criticisms leveled against AMG models of yore was their punishing ride on average American roadways. The AMG GT, however, is surprisingly livable. Pick up the pace, and the GT grips tarmac unlike any vehicle ever to wear an AMG badge. A total of 503 horsepower is a lot of thrust in a lightweight, rear-wheel-drive package, but the direct manner in which the GT S communicates to the driver through the seat, steering wheel and brakes makes every input impressively predictable. Peak torque arrives before you even reach the 2,000-rpm mark, while power continues to surge in such a dramatic-yet-orderly manner that additional thrust would certainly upset the balance of the car. Despite a wide turning circle, around town the AMG GT charms with comfortable touch points, a well-suppressed cabin that’s actually a shade quieter than that of a 911, and a surprising amount of storage space. Building a fast car isn’t particularly difficult by today’s standards. Getting a fast car to stop swiftly and smoothly in nearly every situation is a different story, but the GT S’s 15.4-inch front brakes bound by 6-piston calipers are up to the task. It may be unrelated to performance, but the standard Burmester audio system is hard to ignore. The 10-speaker arrangement delivers the crisp highs, clean mids, and hard-hitting lows expected of a top-tier audio system. Although they are a bit firm for our tastes, the seats do an admirable job of holding you in place during spirited driving thanks to power-adjustable leg and side bolsters. Nestled between the seats is a unique-yet-minimally-functional center console designed to resemble the layout of a V8 engine. Explore the space, and you can alter things like drive modes, suspension firmness and exhaust volume. On a more practical note, opening the GT’s rear liftback exposes a very respectable 12.3 cubic feet of cargo space, enough to accommodate two golf bags. While not a direct descendent of the SLS, the AMG GT is its closest living relative. Seductively sculpted lines and elegantly edgy proportions recall not only the SLS, but other iconic Mercedes-Benz sports cars dating back nearly a half-century (see Mercedes 190SL, 300SL). The long hood, short deck, functional side vents and retractable rear spoiler produce a look so special that it spawned a new hyphenated subdivision dubbed Mercedes-AMG. Unlike the Porsche 911, the Mercedes-AMG GT comes notably well-equipped with niceties like heated AMG performance seats with memory wrapped in Nappa leather, keyless access and start, eight airbags, navigation with an 8.4-inch display and audio by Burmester, full LED headlights with automatic high beams, a rearview camera, and adaptive cruise control. Add-ons consist of a widened powerband suitable for race situations, matte-carbon-fiber interior trim, carbon-fiber exterior accents, six staggered wheel options, softer leathers, a panoramic moonroof, lane-departure warning and blind-spot monitoring, which we highly recommend due to the GT’s limited rearward visibility. Longitudinal g-forces come courtesy of a 4.0-liter twin-turbo V8 that puts out 456 horsepower in the GT and 503 horsepower in GT S models. In this day and age when you can purchase a 600-plus-horsepower sports car like a Dodge Challenger Hellcat or Corvette Z06 for under $80,000, the GTS’s 3.7-second 0-60 sprint and 193-mph top speed might seem a bit underwhelming to discerning Vin Diesel types. But it’s the seamless, almost graceful way in which the GT and GTS deliver their power that distinguishes them from less expensive and decidedly less refined rivals. Directing all that velvety power to the rear wheels is a 7-speed dual-clutch automatic transmission that clicks off gear changes so fast that the tach needle can barely keep up. To keep it competitive against rivals like the Audi R8 ($117,000), Jaguar F-Type R ($104,000), and high-end Porsche 911 models (Carrera S $104,000, 911 Turbo $151,000), the 2016 Mercedes-AMG GT S opens with a Manufacturer’s Suggested Retail Price (MSRP) just north of $130,000, with the standard version checking in right around $110,000. Go nuts with the options sheet and you can easily tack on more than $40,000 to the base sticker price. To find out what others are paying for the Mercedes-AMG GT and GTS in your area, check out KBB.com’s Fair Purchase Price. As a brand-new nameplate, Kelley Blue Book has yet to determine the AMG GT’s long-term residual values.